I hacked this small tool to take screenshots of my app running in the iPhone-Simulator. Before that, i took a screenshot and cropped the application screen with the help of Pixelmator. Especially when you need screenshots in different languages this takes a lot of time (version by version of your app). 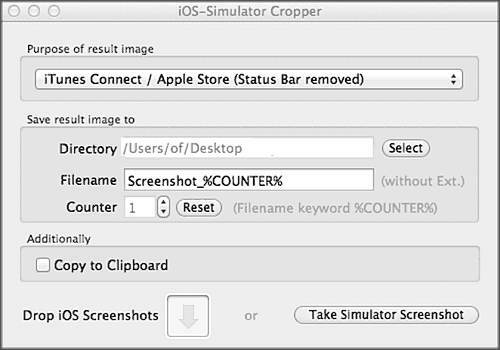 Another point to mention, you should upload screenhots in iTunes Connect as a JPEG in the resolution 320x460 pixels. This is without the status line on top. It is very easy to use. Just start your iPhone app in the Simulator. Be sure that the Simulator window is not covered by any other window. Start this app and press the „Capture“-button. Hint: If it cannot find the iPhone-Simulator, then use the Fuzzy detection slider and move it step by step to the right until it founds the simulator!